Home / Rhône / André / Polar Vortex? Try Châteauneuf-du-Pape. With frigid air arriving this week across the country, the warm sunlight of summer in Provence may seem a long way off. But pour yourself a glass of smooth, cozy Châteauneuf-du-Pape, close your eyes, and you might even forget to check the temperature outside. Our favorite CDP these days comes from one of the appellation’s foremost producers. Jacqueline André tends her ancient 140-year-old vines with the care and attentiveness of a loving parent. The original organic and biodynamic source in Châteauneuf, André’s wines are a standard for elegance and clarity. The 2015 Pierre André Châteauneuf-du-Pape is magnificent. From a vintage dubbed one of the best in the last dozen years, the 2015s offer immediate enjoyment. 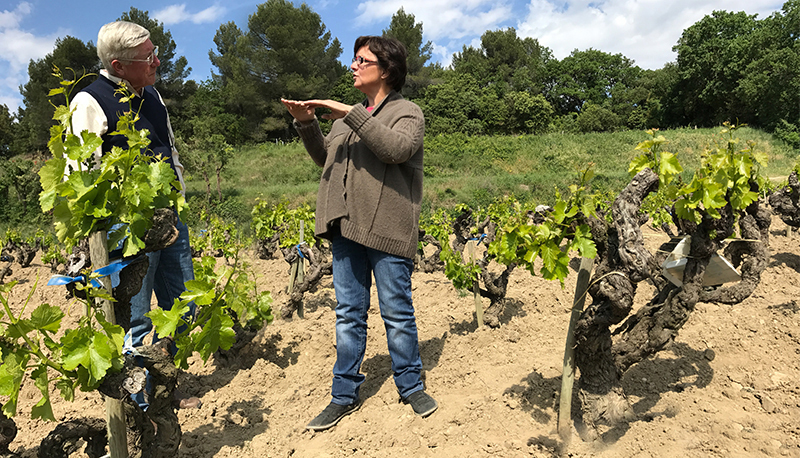 The most successful 2015s were those that kept alcohol in check and retained some acidity — as it turns out, Jacqueline André is a master of balance. She tends her ancient vines using biodynamic farming, which helps the wines keep their freshness and enhances their complexity. Look for notes of plum, licorice, raspberry jam, and tapenade in the nose — the mouth is dense and extremely long, with bold flavors of cherry jam and wood bolstered by rich, voluptuous tannins. This velvety, intense, and mouthfilling — just the ticket for this blast of cold air. Previous post: “Vibrant,” “Delicious” 2016 White Burgundy from Michel Gros.